Stilgoe is an odd name, and nobody seems to know where it comes from. My Dad and my grandfather were both very keen on family history, and traced the family a long way back – which wasn’t very difficult, given that most of the Stilgoes lived in Deddington in Oxfordshire, (some of them still do) and the name is quite unusual. Even more unusual is the name Zachary (or sometimes Zachariah) Stilgoe. We have fourteen of them in the Family Tree, because in 1668, just before he died, my eight-greats grandfather Zachary Stilgoe had a brass tobacco box made, with the inscription “This box is bequeath’d to him whose name is Zach. Stilgoe for ever”. Since then there has almost always been one, and the current holder of the name is my five-year old grandson Zachary, who will eventually get this small (and virtually worthless) heirloom. There are various Richard Stilgoes – one who is a London apprentice in 1616, and another who swears in 1540 that James Perkins was with him and not Mrs Perkins on the night in question. The oldest Stilgoe my grandfather could discover was John Stillego, who lived before the invention of spelling in 1331, when he was pardoned by Edward III for letting a prisoner called Hugh de Buk escape from the Castle of Eye in Suffolk, where he was the jailer. His wife Agatha was paid fourpence ha’penny a day for doing the King’s laundry. Poor John was eventually murdered in 1356 by a man called Walter Atte Feld. We are not usually a violent family, but I should also mention one of the London branch of the family, Elizabeth Stilgoe, who in 1676, in Stepney, “assaulted a certain Edmund Yates, and beat and maltreated him so that his life was despaired of". On the 12th Jan. 1676, she confessed and was fined three shillings and fourpence. I offer late but unreserved apologies to the Yates family. I never met the family historian grandfather, who was London’s water engineer and by all accounts a great man. I obviously met my father, who was Liverpool’s water engineer and also, in a son’s loving and biased opinion, a great man. I have met Stilgoes wherever I have gone. I have met Eric Stilgoe, after a concert in Whyalla, South Australia, and I have read the works of John Stilgoe, a professor at Harvard. 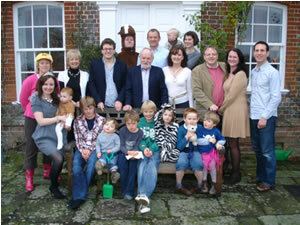 If there are any Stilgoes out there I haven’t met, do please get in touch at info@richardstilgoe.com. I am hugely grateful to this list of people who encouraged me and aren’t still around to decide whether it was worth it.